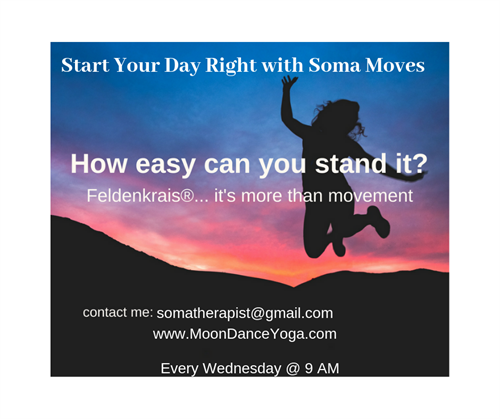 Soma Moves is an Awareness Through Movement(R) or ATM(R) class, based on the group version of the Feldenkrais Method(R), where students are verbally guided through a movement sequence designed to explore/modify/enhance a specific function or set of functions, such as movement in the hips, the shoulders or the neck for instance, enhance the ability turn or getting up and down from the floor. It is logically pieced together, so the student experiences in her/his own body the usefulness of certain movements/actions and the lack of necessity or even the contrary ones of others. All this means that by going through a lesson we will find ways to less effort, more lightness a more optimal way of moving our whole self.